WireWorld’s line of flat HDMI® cables includes Six different levels of price and performance. All of these cables utilize proprietary WireWorld internal designs with material improvements that enable each upgrade level to provide even higher levels of image and sound quality. 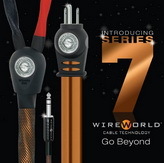 WireWorld USB cables feature a unique flat design that allows it to function over significantly longer runs than conventional USB cables and provides improved sound quality in media server, PC audio, and other digital music applications.